If you keep telling people about thoughts and stories from your current read, it must be worth sharing. 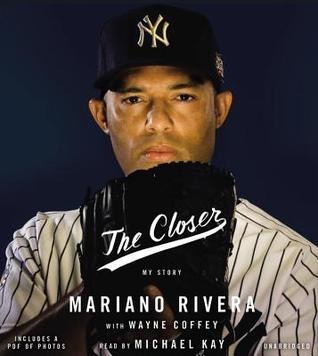 Such was the case for me with Mariano Rivera’s book, The Closer. Unless you’ve been an avid follower of his throughout his career, it’s likely you don’t know much about his upbringing in Panama, that a career in baseball wasn’t his childhood dream, and even crazier, that he wasn’t groomed as a pitcher (he loved the outfield). He certainly gives the baseball nut much to ingest, but there’s something for any reader in this book. Like he married his childhood sweetheart. Oh, and that after baseball they renovated an abandoned Presbyterian church in New Rochelle, New York, to open a new church, Refuge of Hope. An audio find in my local library, this was worth the listen. I had to get accustomed to the reader; but once I did, I was all in. Even shed a tear or two. Baseball. God. Passion. Love. You’ll find that and more in The Closer. Add it to your next up list. Hey John , great seeing you the other night. Being a Yankee fan I will give this a go. Mariano had ice water in his veins and was the greatest closer of all time. Always good to see you. Enjoy the book.